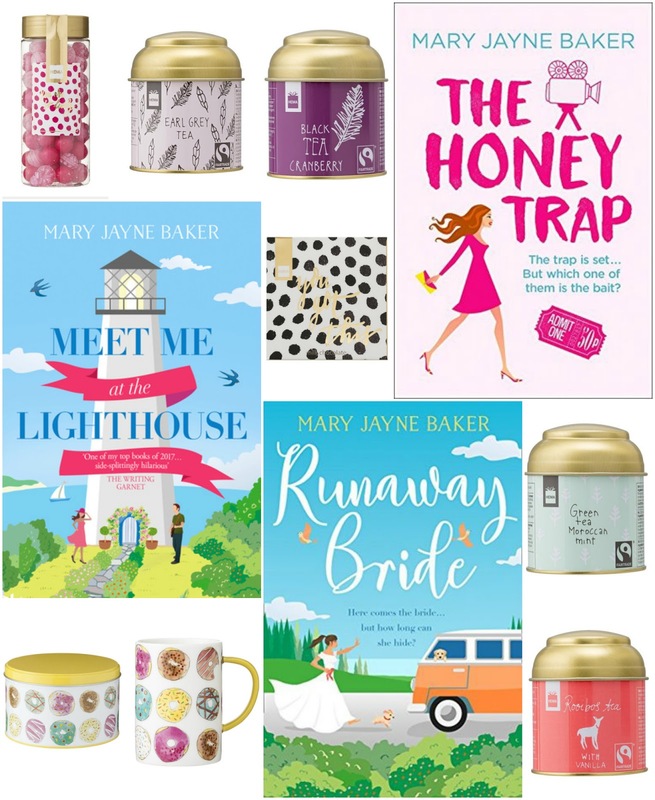 Enter this giveaway for a chance to win books by Mary Jayne Baker, candy, chocolate, tea, a mug and a matching cookie tin. Good luck! I love romantic comedies because mixing comedy and romance is just fantastic. You have the budding love/romance and the laughs! "What do you like the most about funny romantic stories and why?" I like the funny parts of the stories, with witty repartee designed to amuse! I enjoy the witty dialogue and how the character's fumble around each other in the beginning of their romance. There is far too much reality in our world, and it's wonderful to escape that and it's so much easier to do that when one's engaged in something that is truly entertaining. I love romantic comedies for that reason! Books and movies! I love romances that make me smile and laugh too. They are very relaxing. Even when things go wrong, that make you cringe, it all turns out good in the end. They make you laugh and feel good. It's a great escape! I like to believe for a few hours that things can end happily. Or at least have a good laugh about it. The witty banter has me coming back for more. I like stories with humor because they make me laugh out loud. Romance isn't usuallt the genre I go for, but occasionally, if I fancy something different, light and easy to read I'll try one for a bit of escapism. I like a good swoon and laugh. To be honest I don't think that I have ever read a story that combines funny and romance! I like that they make me laugh and smile. I like how they make you feel good. Comedies and romance both make me laugh and smile. I prefer funny romantic stories to the more sincere ones because they don't take themselves too seriously and, usually, the characters are more likeable. I love funny, romantic stories because they make you laugh but also make your heart warm! I love romance stories - to read about the couples and how they met, who they are, etc. is so much fun. Whenever I need to relax and have a great time, they do the trick. What i like about funny romantic story is the mood and the funny romantic story itself, because it makes me smile and comforting. Anything that makes you laugh always makes you feel good. Romance is always full of ups and downs do plenty of scope for funny situations. They are "so normal" and you can really engage with the characters. It's OK to have a "normal romance" but inject a sense of humour into them and it's perfect. You can find yourself crying with laughter at the things people get to up/the things they say/and the situations they find themselves in. It's a great "runaway novel" to escape from a stressful day at work. Some have really good jokes that I love reading. Funny stories show humor and lift your spirits high by uplifting the mood levels.